The induction of new Lion Paula Bradley, seen here with Club President Sheilagh McGirl and sponsor Stephen MacDonagh. Malahide Lions Club welcomes new member Vivienne Keavey, inducted on January 17th, 2017. Vivienne is pictured with sponsor Stephen MacDonagh, visiting Vice District Governor Theresa Dineen and Club President Sheilagh McGirl. This trophy is presented annually to the winner of the Scrapbook Competition. This was awarded to Malahide Lions Club at this years annual convention in Antrim. The scrapbook was assembled by Lion Alfie O'Dowd. 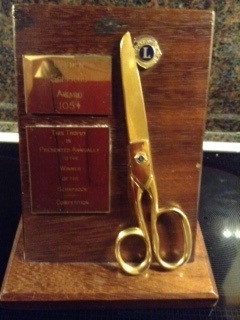 The club is delighted to have been awarded this trophy at the District Convention held in Kilkenny in March 2012. We hope this newly designed and updated website is just as good as the old one! 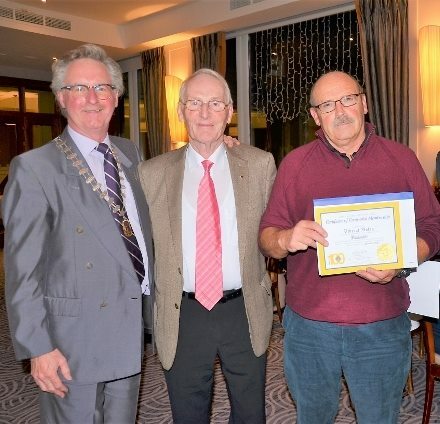 Congratulations to Brian Dooley, President of the Lions Club, who was awarded the Organisation of the Year Award. This is to an organisation that has made a significant contribution to the business or community life of the town. The Malahide Business Awards 2011 took place in the Grand Hotel on Wednesday, 23rd March 2011. 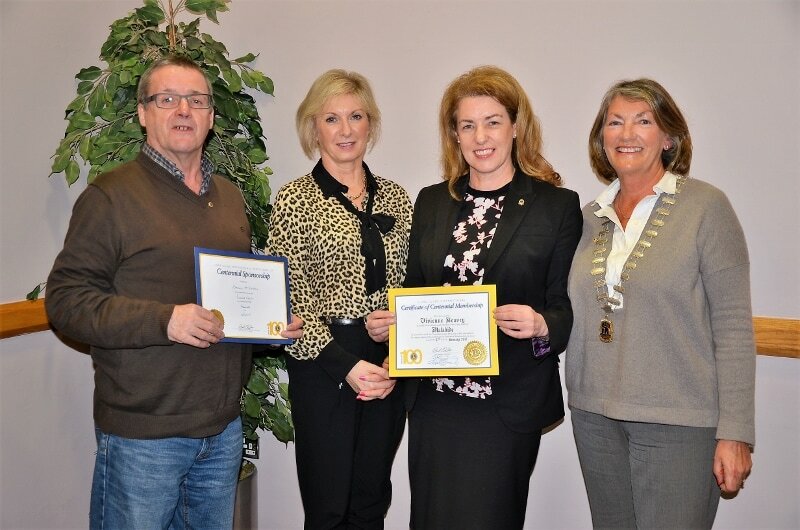 Pictured (right) are Malahide Chamber of Commerce President Al Ryan, Malahide Chamber of Commerce Vice President Deirdre Rochford and Lions Club President Brian Dooley. At the meeting of 5th April 2011, Lion President Brian Dooley presented Lion Frank Higgins with his special award pin in recognition of his 25 years service to the Lions Club and the local community. 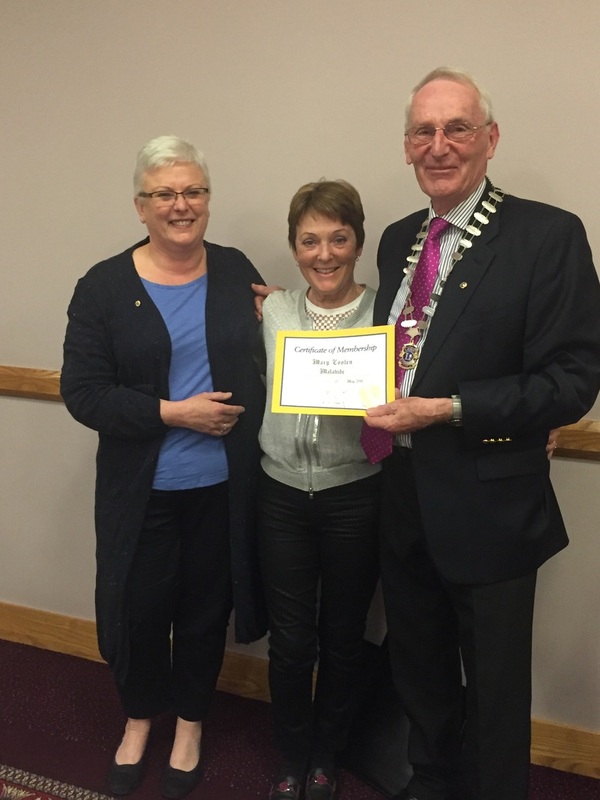 Malahide Lions Club is delighted to welcome Mary Coolen who was inducted at a ceremony at our meeting in the Grand Hotel, Malahide on Tuesday 3rd of May 2016.